Have you ever noticed that the most active divers on the dive site are the one’s who are Diving Drysuit with Doubles? Quite often its the same 10-12 divers who sign up for a lot of the same trips and who often prefer diving together with the group. The reason for that is comfort, with their kit, with the group, with themselves in the water, whereas the other 10-12 guests are a revolving door of divers with a ranged diving background. In this blog we are going to talk a little about the benefits of diving Diving a Drysuit with Double Tanks. 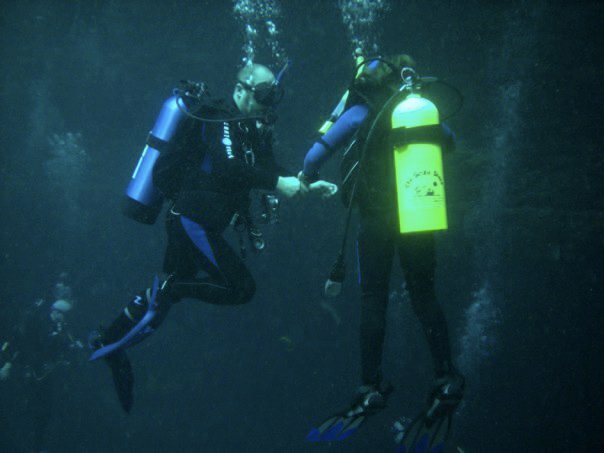 By the end of this reading you should have a clearer understanding of the partnership between diving with a drysuit and doubles, the benefits of diving with a drysuit and doubles, some of the training offerings with divers in a drysuit and doubles and where diving in a drysuit and doubles can take you. Why Dive Drysuit and Doubles? At first it sounds a little much, diving a nylon or neoprene full body suit, hood, gloves and then more weight than we even used in a wetsuit? Drysuit divers wear approximately 6-8lbs minimum in fresh water (more in salt because of the added buoyancy) more weight than a diver in a single piece 7mm jumpsuit (or about the same weight as they’d wear with an old school farmer John and Jacket). That added weight can be inconvenient at best. Where does one put that extra weight? Most of our DDS Divers utilize a backplate and harness system which promotes better horizontal trim, posture and streamlining , it’s expandable and fully adjustable to accommodate the drysuit much easier than a jacket bcd can and is far more comfortable. To learn more about backplates in general, please click the hyperlink above. Divers diving in Canada with a single tank often times use a stainless steel backplate with a weighted single tank adapter, that system has a total negative buoyancy weighting of approximately 10lbs. Nearly enough to sink anyone in a 7mm wetsuit with 2-3lbs maximum per side additional, however a drysuit diver is going to require an additional 6-8lbs minimum depending on the undergarments they wear. In an attempt to promote proper horizontal trim, the diver will want to re-distribute the weight evenly around the body with a maximum of 4-5lbs per hip pocket and up to that much weight on each of the single tank straps for a total of up to approximately 20lbs of weight plus the backplate system = 30lbs. Doesn’t that seem like a little much? In an attempt to minimize the weight the diver wears, many will go to a single steel tank which can be 2-8lbs negatively buoyant by todays standards diving with a Faber steel cylinder. A few years ago Worthington cylinders were preferred for their additional negative buoyancy characteristics with the X7-100 and X8-130 being the 2 most popular options. In Faber the FX100, FX133 and LP85 are our most popular sizes. Strangely enough the 100’s and 130’s were also the most suitable tanks for doubling up for deeper dives. Faber FX100 swings from -8.41lbs full to -0.59lbs empty. Having a tank that is negatively buoyant allows divers to reduce overall weight required and keeps some of that negative buoyancy behind you which helps improve your trim rather than having all that weight on the hips, but you don’t want to overweight yourself with tanks too heavy and underwear too thin. Try and find the balance. Many divers will even favour aluminum tanks for shallow shore diving with thin garments. Adding an extra tank minimizes or eliminates the need for additional weight while adding a safer configuration that builds on our progressive single tank system utilizing a long hose/short hose and spg on 24″-26″ HP hose and it gives divers the ability to solve a catastrophic failure thanks to redundant regulators. Aluminum twins are popular option for divers looking for a great wetsuit set that can be used with a drysuit, however, they are more suitable for use on shallow dives. When worn with a drysuit the diver will have to wear a heavier steel plate, a v-weight with lead down the centre of the tanks and a compact and streamlined wing. They are easy to dive with little learning curve. Steel tanks will take the diver further through deeper dives, caves, wreck penetration and offer more reserve gas on the divers back to deal with emergencies. Many divers prefer the additional gas capacity of the steel tanks as well as the larger sized tanks allow divers to dive deeper and stay longer in comparison to the standard aluminum 80 tank which is still the most popular scuba diving tank on the market. Drysuit Divers and DDS Divers have better trim because a drysuit surrounds the entire body with a little bit of air (less is better). Redistribute weight, minimize weight and enjoy easier diving. As divers tend to dive more off the dive boats and spend more time on their favourite dive sites, divers start looking at how to get more bottom time. Diving Nitrox allows divers to gain up to 50% more bottom time on sites around 100′ and deeper, while yielding even more bottom time shallower, however, the limiting factor at that point tends to be their breathing rates and the sizes of tank they use, so a steel tank will in fact increase their bottom time an allow them to achieve their dive plans up to the Nitrox NDL most dives. For divers who find even on Nitrox, the NDL isn’t always long enough, extending their range into decompression diving often is the trick, as a diver learns how to properly and safely plan their dives with a little bit of decompression utilizing advanced nitrox mixes to accelerate decompression times. This is where doubles are most beneficial. When a diver combines the drysuit for maximum exposure protection and comfort along with a set of twin tanks, they no longer have to worry about switching out their tanks on that rocking dive boat in between dives, they no longer have to worry about adding weight to their hips or anywhere usually on their body, and they can certainly benefit from the increased balance and comfort that doubles offer. You’ll also find divers enjoy just going out and working on foundational skills is easy to observe as our divers are always out in open water honing their skills. Diving Dry with Doubles allows for more even balance in the water as the tanks are placed over top of each lung rater than down the spine like a single tank, while giving the diver a more comfortable suit to don and doff. Drysuits are easier to put on than a 5-7mm wetsuit. Drysuits are more effective for warmth retention. Crushed neoprene or trilaminate Drysuits don’t compress with depth like wetsuits which get thinner with each atmosphere making the diver heavier because of the initial weight they start the dive with, as well as making the diver colder because those thick suits become much thinner every 30ft/10meters they descend. If you can carry them on your back, reach your valves and dive with them comfortably, the answer is yes! DDS Divers working on valve shutdowns on dry land getting the sequence down. Look at the number of accidents that have happened in recreational diving situations with single tanks, especially on deeper dives. Most recreational diving accidents occur in a single tank with no redundancy (pony bottle, sidemount, h-valve, doubles) or lack of training. A diver breaths their tank empty, their buddy runs out of air and they didn’t reserve enough gas for them and their buddy to ascend, they went in cold water and the regulator froze up, they hit the regulator or tank valve off a shipwreck or overhead environment creating a catastrophic failure, the BCD freezes, their dive computer blows off the end of their high pressure hose (another reason to wrist mount your computer) so they panic seeing bubbles streaming out of the high pressure hose, etc…. Minimize the risk, Increase the Fun and Learning and be more mentally and physically prepared with more advanced training. If you’re interested in diving deeper than 80′, cavern or cave diving, technical diving, ice diving, mixed gas diving or wreck penetration, you should do it on doubles. To many people did it wrong and it cost them their lives. Be the best diver you can be. Get involved with DDS and we’ll make you the best diver you can be with our training, experience dives, trips, charters and exploration offerings. Redundancy: Doubles allow the ability to shut down your regulator in the event of a failure, free flow, freeze-up, burst disc failure etc. Isolation manifold allows to shut down and switch over by isolating and shutting down the offending post or just shutting down the offending post. Narcosis Management: Don’t Dive Deep On Air. You’re narc’d at 130ft/40meters whether you know it or not. Don’t dive deep on air, it’s silly, outdated and unsafe with education and helium training available now. Analyze Your Mixes: Always, Always, Always analyze your mixes when you pick your tanks up, make sure they’re labelled and if diving with a fill that was “just filled” and you have to grab and go, analyze it again before your day of diving begins. Practice , Practice, Practice: Complacency Kills. Work on trim, buoyancy, bottle handling, dealing with simulated emergencies, smb deployment, alternate fin kicks, etc. Be the most polished and best diver you can be. Don’t just jump into drysuits and doubles blindly. It requires the right fitting suit and undergarments first and foremost. Many brands of drysuits are inferior in fit and quality, even the brands offering “custom fit”. If you truly want to LOVE your drysuit and want to enjoy using it, take the time to get properly measured and properly fit. Don’t just let the dive store hand you a suit off the rack and tell you that it’ll fit you perfectly, we’ve had that happen to several students from out of town that couldn’t complete their required skills during Intro to Tech Training and ended up renting suits from us to finish the class, then ultimately buy a brand new suit from us. We are partial to Diving Unlimited International because they offer the best quality, service, workmanship and there is an actual after sales service with them. They are our top choice for hard to fit people too. It’s all about comfort and fit with them. DUI have great value priced suits with their Coronado, San Diego and Yukon II suits and the new Cortez (2019) suits obliterate most brands “top of the line suit” for quality, features, performance, as well as coming with user replaceable quick change ZipSeals, meaning you don’t have to send the suits away for service unless you damage the suit or zipper! No brand can compete with that! Santi offers a great quality and great looking suit. We do their stock and modified stock suits. You’re allowed up to 4 alterations at no extra cost with them and they do offer custom too. Suits are very tough and stylish with a beautiful Euro look of elegance and colour. They do take some time 2-3 months typically (sometimes less sometimes more). Fourth Element offers the most flexible drysuit on the market. It’s durable and looks great and they’re using technology to their advantage instead of dive stores who can miss measure someone by using BIOMAP technology to digitally create an image of the person to cut the suit for. Great suits for a great price with great service…it might just take a bit more time to get the suits made 2-3 months typically. BARE offers a great stock suit at a good price depending on what you get with the suit from your LDS. Just but it from DDS and you’ll be happiest. The Drysuit Underwear is as important for fit and mobility as the drysuit itself. Santi offers modified stock and custom underwear, DUI offers DuoTherm ultra stretch polartec suits for custom fit as well as a great selection of stock sizes in up to an XM450 material which is exceptional underwear for cold water. Fourth Element offers an amazing range of suits for a range of conditions made with some of the nicest feeling and fitting materials. Learn more about diving doubles by stopping in or sign up for a Discover Doubles NTEC night with us. NTEC will introduce you to the doubles configuration, foundational skills you should master, emergency drills and more. It’s a perfect prep-workshop that introduces divers to the principles that will help lay the groundwork moving forward towards more regimented training with the right guidance, education, exercises and more to help ready you for our NAUI Intro Class. Our NAUI Intro to Tech Course is a Rudimentary Elements of Diving Course that will highlight the foundational skills and develop them from a recreational perspective that will dovetail into more advanced and technical diving activities and show recreational divers a preview of what their diving can be like by testing and honing a divers finesse, comfort, trim, buoyancy, effortless skills, problem identification and reactions, team diving, smb deployments, buoyancy refinement, fin techniques and so much more. NTEC and Intro are the 2 most exciting, modern, challenging classes that will help improve your skills and enjoyment in the drysuit the most. Tie in NTEC and your PADI Drysuit Specialty Course together and see diving with a different mindset than what you’d hear/see/learn in a traditional PADI system of diving education. Diving Dry allows for longer bottom time in cooler water or more dives per day. A more comfortable gear up experience from a boat. When you look at our DDS dive trip pics on Facebook or Instagram you’ll notice aside from a pool or an open water course weekend, the majority of the divers you see on our trips and con-ed classes are all in drysuits and you’ll notice that a lot of the same divers come out year after year on our charters and trips because their level of enjoyment is substantially higher than a wetsuit divers. A friend of ours had a shop in Massachusetts and they trained their divers exclusively in drysuits. They offered by far the most expensive open water course from NY-Maine and everywhere in between, yet their continuing education rates were 400% vs a national industry average of about 25% of divers who go diving and train after open waters. So they found enormous success training their divers and promoting colder water diving trips because like DDS, they realized the best diving in the world was around the Great Lakes, Atlantic wrecks, Florida and surrounding areas. They were right. Drysuits will last you longer than a wetsuit, will give a diver buoyancy control that is easier to maintain when you where a little “squeeze” on the suit vs a wetsuit which compresses and changes depth the deeper or shallower you go. Drysuits will allow for colder water immersion and more dives per day, while in between dives the divers will warm up faster, so the energy that is rejuvenated is much higher, especially with todays’ warmer Thinsulate’s and heated systems. Combining a drysuit with a set of doubles sets a diver up for a lifetime hobby where anything is achievable. The divers can spend more time under the water enjoying their hobby. They don’t have to change tanks awkwardly on the boat in between dives like single tank divers do. They add a larger gas source to deal with emergencies such as low on air or an equipment failure, while also adding redundancy in the event of a regulator or valve failure. Aside from a little extra weight on land, there isn’t much difference between a single tank and a lot of lead to sink a recreational diver and a set of doubles. For divers who can’t wear a set of doubles, try Sidemount! Sidemount is a great option for divers who don’t have the ability to reach back to shut a valve down or who have had back surgery or a physical limitation that negates the ability the wear doubles on their back. At Dan’s we believe in a more fun progression, so training our divers the right way from the very beginning is so imperative and gives them so many more options moving forward beyond Open Water, Advanced, Drysuit, Rescue, Divemaster and Instructor. Don’t get caught in the boring progressions that the recreational agencies endorse, there is a much more fun, challenging and enjoyable progression ahead. Experience more in the world of scuba diving instruction with Dan’s and let us show you a better way to do things that makes more sense and creates better divers. Dan’s is an innovator of progressive recreational and technical diving, bringing the most modern skills and philosophies forwards before anyone in Canada as we continue to lead and offer the highest standards and most exceptional dive training for recreational and technical diving and have helped shaped some of the finest explorers in the world of scuba diving too. Train with Dan’s and see a brighter diving future.